A brief history of the world's first socialist working class uprising. The workers of Paris, joined by mutinous National Guardsmen, seized the city and set about re-organising society in their own interests based on workers' councils. They could not hold out, however, when more troops retook the city and massacred 30,000 workers in bloody revenge. 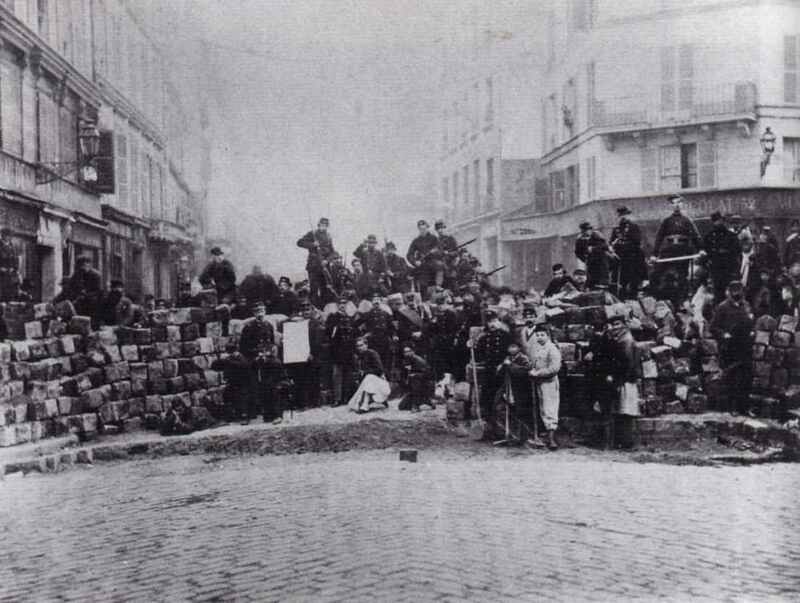 The Paris Commune is often said to be the first example of working people taking power. For this reason it is a highly significant event, even though it is ignored in the French history curriculum. On March 18 1871, after France was defeated by Prussia in the Franco-Prussian war, the French government sent troops into Paris to try and take back the Parisian National Guard’s cannon before the people got hold of it. Much to the dismay of the French government, the citizens of Paris had got hold of them, and wouldn't give them up. The soldiers refused to fire on their own people and instead turned their weapons on their officers. The PNG held free elections and the citizens of Paris elected a council made up mostly of Jacobins and Republicans (though there were a few anarchists and socialists as well). The council declared that Paris was an independent commune and that France should be a confederation of communes. Inside the Commune, all elected council members were instantly recallable, paid an average wage and had equal status to other commune members. Contemporary anarchists were excited by these developments. The fact that the majority of Paris had organised itself without support from the state and was urging the rest of the world to do the same was pretty exciting. The Paris Commune led by example in showing that a new society, organised from the bottom up, was possible. The reforms initiated by the Commune, like turning workplaces into co-operatives, put anarchist theory into practice. By the end of May, 43 workplaces had become co-operatives and the Louvre Museum was a munitions factory run by a workers’ council. The Mechanics Union and the Association of Metal Workers stated “our economic emancipation . . . can only be obtained through the formation of workers' associations, which alone can transform our position from that of wage earners to that of associates." They also advised the Commune’s Commission on Labour Organisation to support the following objectives: “The abolition of the exploitation of man by man... The organisation of labour in mutual associations and inalienable capital.” Through this, it was hoped that within the Commune, equality would not be an “empty word”. In the words of the most famous anarchist of the time, Mikhail Bakunin, the Paris Commune was a “clearly formulated negation of the state”. As the Commune kept some of the old ideas of representative democracy, they stopped the people within the Commune from acting for themselves, instead trusting the governors to sort things out for them. Anarchists argued for federations of directly democratic mass assemblies, like the people of Paris had done just over a hundred years previously (must be something in the water!). The council became increasingly isolated from those who’d elected it. The more isolated it got, the more authoritarian it got. The council set up a “Committee of Public Safety” to “defend [by terror]” the “revolution”. This Committee was opposed by the anarchist minority on the council and was ignored by the people who, unsurprisingly, were more concerned with defending Paris from invasion by the French army. In doing so, they proved right the old revolutionary cliché of ‘no government is revolutionary’! On May 21st, the government troops entered the city and were met with seven days of solid street fighting. The last stand of the Communards took place at the cemetary of Montmartre, and after the defeat troops and armed members of the capitalist class roamed the city, killing and maiming at will. 30,000 Communards were killed in the battles, many after they had surrendered, and their bodies dumped in mass graves. The council became increasingly isolated from those who’d elected it. The more isolated it got, the more authoritarian it got. The council set up a “Committee of Public Safety” to “defend [by terror]” the “revolution”. This Committee was opposed by the anarchist minority on the council and was ignored by the people who, unsurprisingly, were more concerned with defending Paris from invasion by the French army. Two things are confusing here. One: It says "the people" ignored this Committee because they were focused on fighting off the French army, but wouldn't a committee to "defend the revolution" be focused on fighting the French army, too? Two: A committee to defend the revolution is essentially what was proposed by Friends of Durruti when they said that a junta of elected delegates to coordinate the civil war was needed. Anarchists generally support that so why were they against a similar thing in the Paris Commune? The article says nothing else about the Committee of Public Safety, and doing a search on libcom and scanning other articles which mention it didn't provide much info, so I don't really know anything about this Committee or its real purpose and what it did. So maybe there were good reasons for being opposed but they aren't apparent. The move to create Committee for Public Safety (there was even a long debate about the name, since it was the same one used by those who instituted the Red Terror during the French Revolution) was proposed for discovering internal (within the Commune) counter-revolutionaries and other dissidents. The few anarchists who were involved correctly saw this as an authoritarian distraction, since it had nothing to do with fighting the off the Versailles army of Thiers. Some information about Blanqui and Proudhon would be helpful. Their followers made up most of the people in the Commune's government.